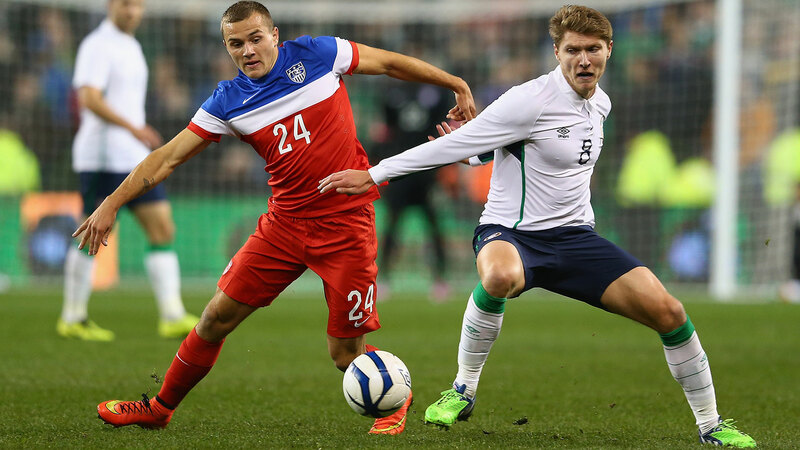 » The Education of Jordan Morris: How Did a Stanford Sophomore Become a Starter for the USMNT? The Education of Jordan Morris: How Did a Stanford Sophomore Become a Starter for the USMNT? “That” was an invitation to the senior squad’s upcoming camp — the first after the 2014 World Cup — before a friendly against the Czech Republic. Morris, who made the All-Pac-12 first team his freshman year, accepted and soon became the first active college player to be on a U.S. roster since Chris Albright in 1999. While he didn’t make it onto the field in Prague, he showed enough to earn another look, making late substitute appearances against the Republic of Ireland in November and Switzerland last month. Then, with Jozy Altidore suspended, Morris started up top against archrival Mexico in mid-April. All he did was score the opener, becoming the first college student to score a goal for the full national team since — well, not even Paul Kennedy, the dean of U.S. soccer writers, is entirely sure. A week later, he found the back of the net in the U.S. U23 team’s 3-0 win over El Tri. “It’s all been a blur,” Morris said, laughing as he struggled to recount which days he was where. So, a question: Why Morris, who wasn’t even on a list of the top 100 American soccer players as of July 2014? Part of the answer is fortuitous circumstance. Before the World Cup, the Americans trained at Stanford and played the Cardinal during a closed-door scrimmage. Morris impressed Klinsmann with his ability to read the game and his one-on-one skill. The second part is that Klinsmann and tactician-in-chief Berti Vogts are obsessed with speed. (See: Yedlin, DeAndre.) And Morris, who says he ran a 4.5-second 40 the last time he was clocked, has impressive pace. Against both Mexican teams, he shuttled down either flank, outrunning defenders to long balls over the top. While Klinsmann wants the U.S. team to play a possession game, that’s been slow progress and the team’s defenders still resort to long clearances when pressed. Having a speedster at the tip of the formation doubles as both a release valve against opposing pressure and a key to unlock opposing back lines. You don’t have to squint to picture Morris streaking through two center backs to get on the end of a chip from Michael Bradley. He still needs to adjust to the speed of thought in the international game, and Morris says he’s working on it, but he possesses the straight-up point-to-point burst to succeed. The third part is philosophical. Klinsmann won’t get fired for bringing Morris into camp and giving the kid a shot. While doing so might anger a few more-experienced players who think they deserve a chance, it’s not like Klinsmann chose Morris over Lionel Messi. If the 20-year-old from Stanford fails miserably, it would be easy enough to put it in the “good job, good effort” category and move on. If he happens to make a smart run, get a lucky bounce, find the ball at his feet, and finish sweetly, well, then someone who’s too young to win the Budweiser Man of the Match scores the opener against Mexico and Klinsmann looks like a genius. The coach wins because he can’t lose. In addition to whatever larger significance Morris holds for the national team manager, he’s representing the embattled world of American college soccer. The intercollegiate season lasts three months, which is significantly shorter than the 10-month U.S. Soccer Development Academy schedule or any club program in the world. The general perception — one that’s mostly true — is that if you want to make it as a professional soccer player, going to college is a handicap since there’s not enough time to train and the training you do get — both from the quality of coaching and from the level of competition at practice every day — can’t keep pace with what’s offered at the professional level. Morris, like Alejando Bedoya before him, shows that there’s still more than one way to make it to the highest level. Although the Seattle Sounders, where he’s played for the U23s and where his father is the team doctor, continue to offer him increasingly larger contracts, Morris plans to stay at Stanford — for now. The sophomore took it easy this semester because he knew he’d be traveling a bit — the U.S. national team is the new semester abroad — but he still has political science and religious studies classes to attend, in addition to practice with his college team. So the education of Jordan Morris will continue, perhaps accelerated by the recent success but not fundamentally altered. The U.S. coaching staff, specifically Andi Herzog, who is an assistant with the senior national team and head coach of the U23 squad that will try to qualify for the Olympics in the fall, wants its emerging star to continue doing what he does best. “We always say you have to work on your weaknesses, but I think it’s more important to work on your strengths,” Herzog told ESPN, citing his charge’s speed and nose for goal. “When you get into those intense games, you want to do what you know and what you’re good at,” Morris said. “I’ve been blessed with some speed and I try to use that to the best of my ability.” He’s picking up tips from Herzog, who made 103 appearances as an attacking midfielder for the Austrian national team and frequently works with the American forwards in his capacity as a national team assistant, and from Klinsmann, one of the all-time goal-scoring greats in world soccer. The newest wrinkle to his game is to start behind the center backs before he checks to the ball, thus making him harder to track. It’s a little tidbit, but he’d never thought about it before. When I suggested that starting from an offside position isn’t something they teach in American youth soccer, Morris agreed: “Exactly, yeah.” From Klinsmann’s mouth to the college kid’s mind. Whether it’s in front of fewer than 10,000 at UCSB or 64,369 at the Alamodome, they all count the same. Noah Davis (@noahedavis) is Grantland’s United States men’s national team columnist and deputy editor at American Soccer Now. Running Back to the Future: Why Is Todd Gurley Suddenly Soaring Up NFL Draft Boards? And Should He Be?